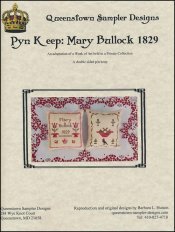 Pyn Keep: Mary Bullock 1829 [C5835] - $12.00 : Yarn Tree, Your wholesale source for cross stitch supplies. Cross stitch chart from Queenstown Sampler Designs. An accurate reproduction of a piece of art held in a private collection. A double sided pinkeep design with animals and floral motifs. Stitch count for each side is 95 high x 86 wide.